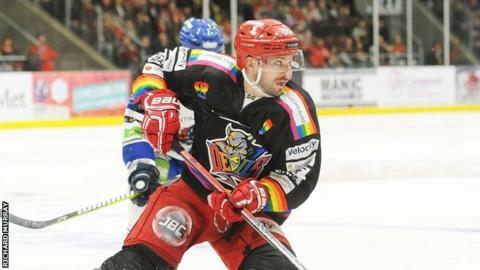 A Joey Martin hat-trick helped Cardiff Devils edge a thrilling Elite League encounter with MK Lightning. Devils were 3-1 down in first period after two goals from Robbie Baillargeon and one from Tim Wallace cancelled out Stephen Dixon's opener. Lightning extended their lead in the second through David Norris and Andrew Valdix, with Devils keeping in touch courtesy of Martin, Sean Bentivoglio and Mark Richardson. Martin then scored twice in the third. Devils remain top of the league and travel to Milton Keynes on Sunday for the reserve fixture.